A plan to convert over two-thirds of the San Francisco Design Center at 2 Henry Adams Street from designer showroom space to general office use is in the works, a use which is currently disallowed as the 330,000 square foot building is zoned for Production, Distribution & Repair (PDR). While the planned conversion flies in the face of a key objective of San Francisco’s recently adopted Showplace Square/Potrero Hill Area Plan, a plan which actively seeks to preserve the supply of PDR space within the district and city, there is a landmark loophole. 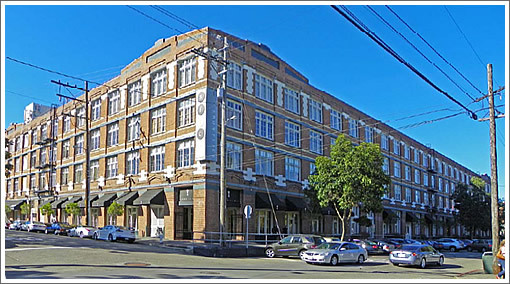 As we first reported last year, another key objective of the Showplace Square/Potrero Hill Area Plan is to ensure the economic viability of historically significant buildings, providing an exception for the conversion of such buildings to office use. And as such, the owners of 2 Henry Adams were planning to seek a Landmark Designation for the building which would clear the way for its conversion. The owners of 2 Henry Adams have since formally filed their request to initiate a landmark designation for the building which was built for the Dunham, Carrigan & Hayden Company in 1915 and served as the corporate offices, warehouse and distribution facility for the company, a wholesale steel and hardware importer/distributor. Next week, San Francisco’s Historic Preservation Commission is slated to consider the request to landmark the building with a preliminary recommendation to initiate the designation. If the San Francisco Design Center at 2 Henry Adams Street no longer makes current financial sense to remain as Production, Distribution & Repair businesses, the City should allow the change to offices. Preserving the exterior should be the only vested interest. I hope the Landmark Designation will clear the way for conversion and preservation. It would make a great food emporium for local vendors. I think there is good reason to maintain PDR space in the city. Not all buildings need to be tech offices. So this is Bill Poland. On the bright side, he is the reason that this area of town has retained its unique character of low rise brick warehouse architecture that in most cities is long gone. He has also put up with a LOT of meddling from the city and its weird notions of preserving dead industrial use zoning (which has huge environmental legacy liability attached to it) and inflexibility with large land owners mostly in an effort to redline neighborhoods from the highest and best use. On the dim side, this building is not an empty former factory that moved out 50 years ago (like so many of the PDR zoned buildings are). This is a vibrant design building — Showplace Square East, to be precise — with a great busy restaurant and a hoard of unique, low density tenants. Filling it with worker bees would be a sad step down. Sorry Bill, because overall I feel you. Just not in this case. We need to preserve PDR space to maintain at least a minimum of economic diversity. The ENP is great on big picture objectives but when you get down to details it’s chock full of convenient loopholes. Dan- sure, force bldg owners towards lower and poorer use is a good thing. It’s commercial for christsake. Ever hear of free market working? Good to know one can actually use the historic designation boondoggle/kiss-of-death as an asset to a building wrt use change. There is something interesting happening in the PDR zoned buildings in the NE mission. If your company makes anything physical, you count as PDR — so there is a growing concentration of robotics companies and other high-tech companies that have a *physical* aspect to their work (bio-tech, advanced manufacturing, etc.). This is awesome for the city. highest value for the land does not necessarily mean offices — there are very high value PDR companies too, but these PDR companies sure end up using a lot of computers and desk space along with their physical production aspects. I agree with Dan. While SF doesn’t need nearly as much PDR space as actual industrial cities like Richmond or Santa Clara, it is in the city’s interest to have some basic stuff close by that is needed for short prototype runs. As for best use of space in a small dense city, look toward places like Hong Kong and Japan where multi-story factories are common. Tear down some of the inefficient 1 and 2 story workshop spaces and build a 10 story multi-tenant building. Design in huge freight elevators connecting to the loading dock. And put more tech offices in high rise office buildings, rather than PDR space. Don’t know how “vibrant” this is. It’s not like this area is buzzing with activity during business hours. I’ve never been inside the building but for its size it generates very little foot and vehicle traffic so I’ve always assumed it’s 2/3 empty. Perhaps that’s why they want to convert 2/3 of it to offices.